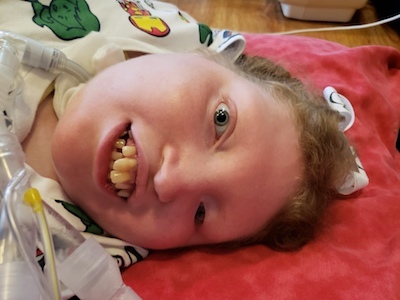 This is story of my daughter Gillian, who has a number of complex medical conditions, including Anopthalmia, Microcephaly, and Agenesis of the Corpus Callosum. My husband and I had been married for 10 years and had tried for three years to get pregnant. The third cycle of infertility treatments finally took and we found out we were pregnant with twins. Sadly, at five weeks gestation we lost one, but the other baby was so eager to be born, that I had to go on bed rest from 21 weeks. So eager was this baby to arrive that arrive indeed she did at 34 weeks, by C-section, weighing 4 pounds 14 ounces. A big baby for six weeks early! Her pediatrician and a neurologist were on hand for her first exam. The first thing they noticed was an abnormal left eye socket, not known if she was without an eye or had a microeye. Later it was learned that she did indeed have only one eye, termed Anopthalmia. Because she is premature, she is transferred to the NICU. As new parents, six weeks earlier than expected, we had not decided on a name for her. For three days, she was just baby female D. We prayed and reviewed our name list and finally believed God gave her the name Gillian. She was not allowed to be in the room with us as she was so small. On the third night, she began having breathing problems and was transferred to another hospital with a more advanced NICU. My doctor had not released me from the hospital yet; however, that didn’t stop me from discharging myself as soon as I heard my baby was leaving. And off we went to a journey of four weeks in the NICU. Gillian was actually only in the NICU as a feeder/grower, being premature, though she was the largest preemie there. During this month, many specialist and doctors were called in to poke and prod our baby, and many conditions, diagnoses and speculations were made. However, all we heard was our baby would most likely not live past six months to a year. Primary on the list of concerns were Microcephaly (a small brain), Agenesis of the Corpus Callosum (the part of brain connecting the two hemispheres was missing), Hemifacial Microsomia (part of her face and structure was smaller than the rest), and, she was literally born with half a brain. We were told these conditions were rare, that all of them would cause seizures sooner than later, and Gillian would be severely developmentally delayed. They tried to diagnosis her with several syndromes but she just did not fit into any one syndrome in particular. She was so beautiful to us. A miracle to us. An enigma to them. Gillian continued to astound specialists renowned in their fields, gaining many more diagnoses including needing a feeding tube at age four, and a trach and vent at age nine. She did indeed begin having seizures and began the journey of many medications and treatments, even now continuing to have seizures every day. We were continually told, she will not live past age five, then age 12, and then not through adolescence. However, these people, in all their expertise, did not count on the tenacity of our little girl, or the power of our God. Our mantra quickly became that we will not allow Gillian’s challenges to impede her having a happy, fulfilled life. We go places essentially every day. 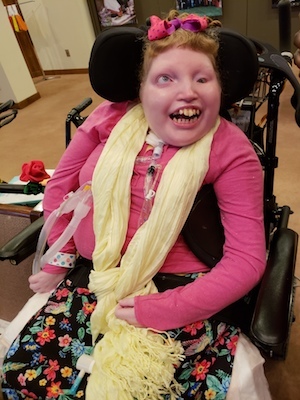 Gillian goes to school, goes to movies with friends and family, attends church almost every Sunday, enjoys community involvement and volunteer activities, bakes and has tastes of everything, and even goes bowling and swimming! She has been in all kinds of therapies such as horseback riding, recreational therapy, and even gets two massages a week. She has been to Prom as well as been in beauty pageants where she was crowned a princess. As a family, we have been to Walt Disney World three times and Disneyland twice. At age one, she went to Vegas with her parents and aunt and uncle. This Girl is a mover and a shaker! Today, in 2018, Gillian is 18 years old, a junior in high school. She does not walk or talk, but she coos in her own way, and is one of the happiest, content persons you will ever meet! Her smile lights up any room she enters. She is loved and prayed for by people we don’t even know across the world. Gillian is our miracle child. Our hearts are made fuller with every new day the Lord gives us! Kimberly is a stay home Mom, daily scheduling appointments, therapies and activities for her daughter. She has been married to Gillian’s father, Steven, for 29 years, and is grateful for the pleasure of staying home. With a Bachelors and Masters in Social Work, 15 years of experience as a Hospital Pediatric Social Worker, Kimberly believes God was preparing her for this exact ‘job’ of caring for her daughter with special needs. When not assisting the 24/7 nurses who care for Gillian, Kimberly enjoys movies, reading, studying the Bible, scrapbooking when there is time, and Girl’s Night Out regularly!